In this section we will discuss some of the confusion in the terminology regarding bulging discs, herniated discs, protruding discs, etc. Many times, even doctors use incorrect descriptive terms. We will use some diagrams to help demonstrate our lesson. The following information is from the North American Spine Society, American Society of Spine Radiology, and American Society on Neuroradiology. 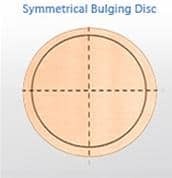 The term ‘bulging disc’ is and should be used as a descriptive term, not a diagnostic term. Here is a bird’s eye view looking down onto a disc. Notice in the diagram the outer ring, this represents a symmetrical bulging disc. The disc tissue is bulging out around the entire border of the vertebrae. This is a rare finding under MRI and CT scans. Although ‘bulging disc’ is a popular term, it is usually not representative of what is really going on at the spinal level. It is used because it is easy to understand. Most people really have a herniated disc. These two diagrams are very accurate in the description (or diagnosis?) of disc herniations. You will commonly find these descriptive terms on your MRI or CT reports from your doctor. By strict definition, a broad-based herniation involves between 25 and 50% of the disc circumference. 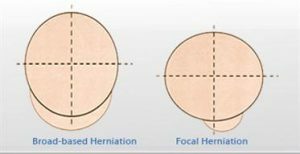 A focal herniation involves less than 25% of the disc circumference. The above information is designed to clarify the use of these terms. The simple fact is that if you have a herniated disc, the disc material can press on the nerve roots or central nerves running through the central canal where the spinal cord lives. This can produce serious back and leg pain, as well as, numbness, tingling, and muscle weakness. Occasionally, the disruption and injury in the annulus fibrosis can be the source of back pain. The outer 1/3 of the annulus fibrosis has a nerve supply, and if the center nuclear materials are migrating through the weakened annulus, this can cause pain. This condition is sometimes referred to as internal disc disruption. This is very difficult to see on MRI or CT scans and is considered to be the early stages of a herniated disc, although it is still not visible on advanced imaging. This condition responds well to our exclusive Method, allowing blood, water and nutrients to enter the disc and begin healing the damaged annulus fibrosis. Please see the diagram below. This is a side view diagram. The left side is the front of the body and the right side is the back of the body. Disc Healing Therapy can be very effective in treating these difficult conditions. The treatment results in an unloading of the offending disc structures, which in turn creates a negative intradiscal pressure inside the disc. This facilitates water and nutrients exchange into the disc, thus, allowing the injury to heal. It also can cause a vacuum-like effect. Allowing the displaced materials to return to a more centralized position. Over time, this treatment allows collagen, one of the body’s healing proteins, to form. Collagen can then repair the cracks and fissures in the annulus fibrosis. In addition, the inner matrix material of the disc becomes healthier with the exchange of water and nutrients. Spine stabilization rehab exercises should follow the program outlined by our Method.